on the top of the Torres de Serrano. 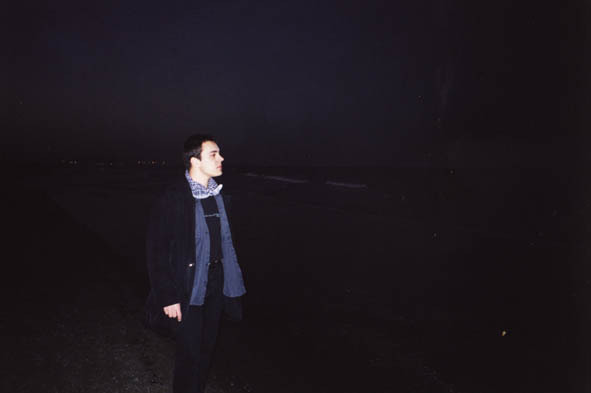 March 2002, days 15 - 20. Valencia in the state of emergency. The police closes the centre of the city. The earth is moving. Shots and explosions can be heard. You can see flashes in the nocturnal sky. But does somebody panic? No. For the Valencian people this state of emergency is normal like drinking coffee or smoking a cigarette. 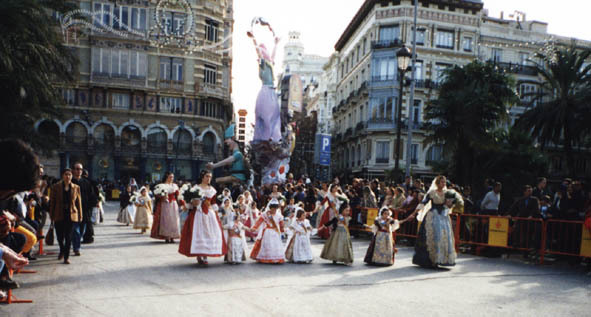 They are in the "Fallas". 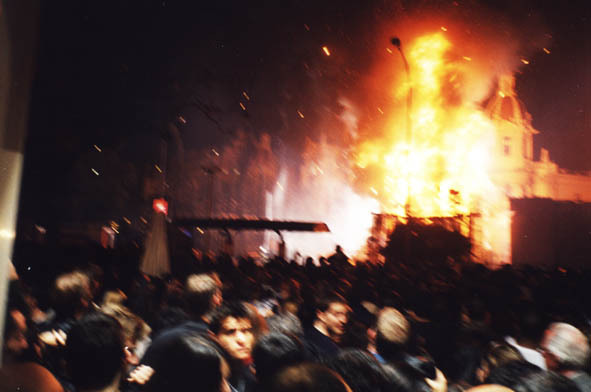 Fallas means fireworks, firecrackers, more fireworks and more firecrackers. But it also means burning down figures or statues made of carton and paper. And apart from that it means flowers, too. Well, and I have mentioned the fireworks and firecrackers, haven't I? 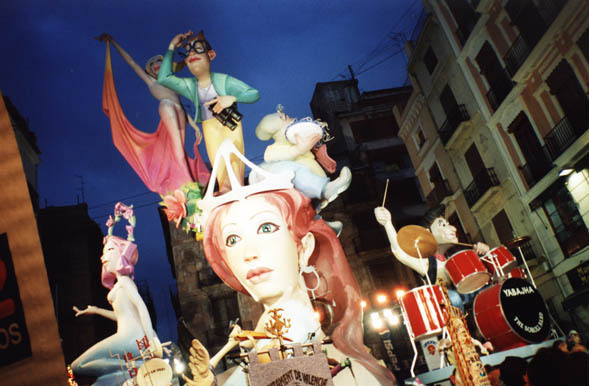 The Fallas are figures and statues made from carton and paper, inside they have a metallic construction to keep it upright. Often they are higher than 20 or even 30 meters. From the outside they are painted beautifully in a way one gets the impression that they are not made just by paper but wood or any even more solid material. 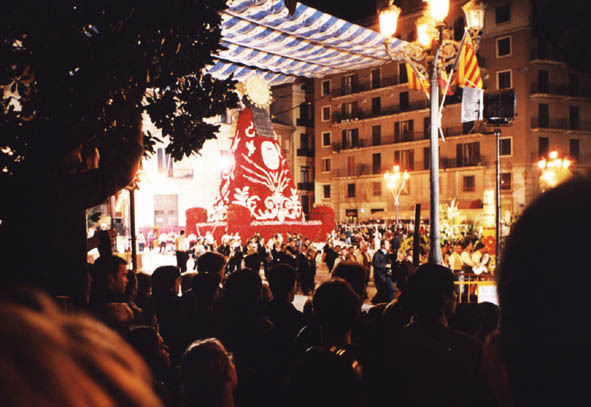 Each district (barrio) got its own Falla, then there are special ones and one on the Plaza de Ayuntamiento provided by the city hall of Valencia. 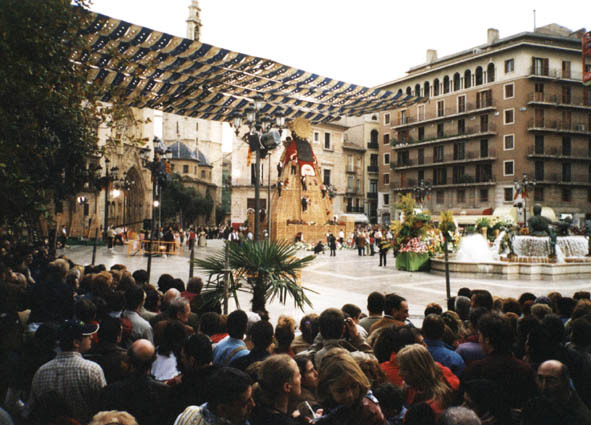 Between the single Fallas there is held a competition, and several juries award them. Each Falla has a certain topic criticising one or even more subjects - they are like 3-D caricatures. 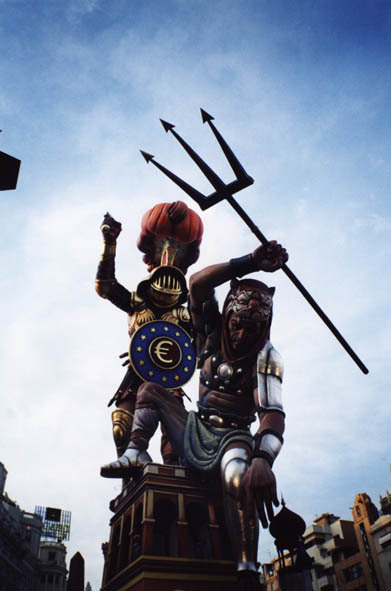 The Falleros, the people who create the Fallas, work a whole year to make their figures. They put a lot of work and of course also a lot of money into their Falla, a middle sized one already can "swallow" about 30.000 €! 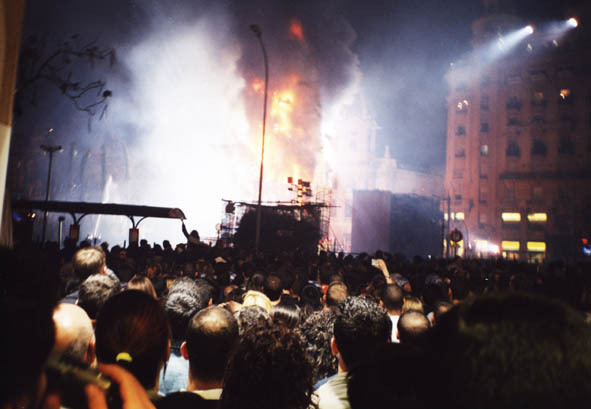 And all this to get burnt down at the end - of course again with special effects and more fireworks. And already the day after they start anew to plan their new Falla. A Falla that rocks. Haha, what a pun. 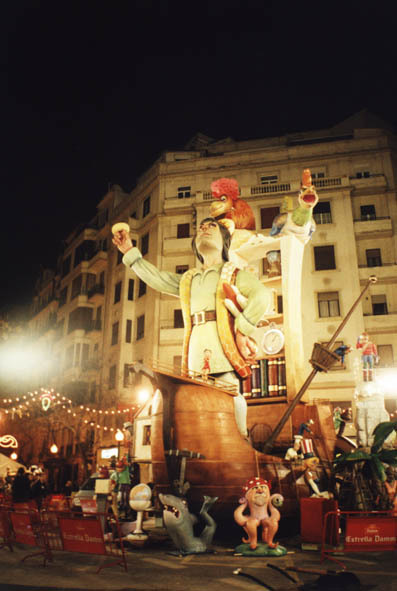 Obviously a Falla that has Christopher Columbus (Colón) and the discovery of America as topic. Please note the doughnut on the pointing finger of Columbus' right hand! 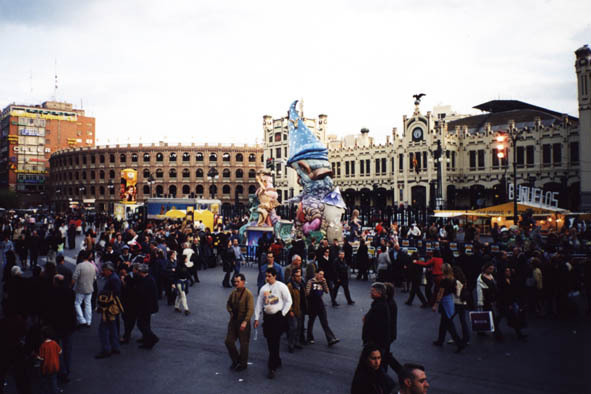 The Plaza de Toros, a Falla and the train station together on one photo. The Falla out ot competition - the Falla on the Plaza del Ayuntamiento. To see it kind of complete and together, click on one of the pictures above. 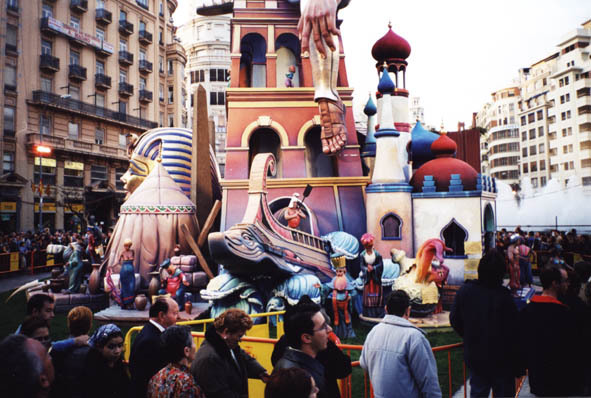 Fallero Tomasito at the main Falla in Egypt. Hahaha. 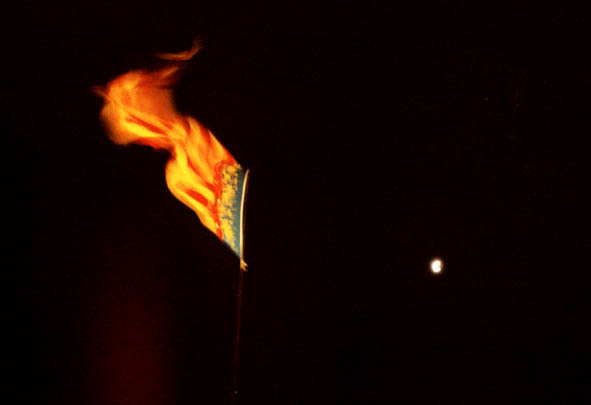 Night of Tuesday 19th to Wednesday, 20th of March, 1:00 a.m.: Burning down the thing. It gets a bit hot, even if you're 40-50 meters away. 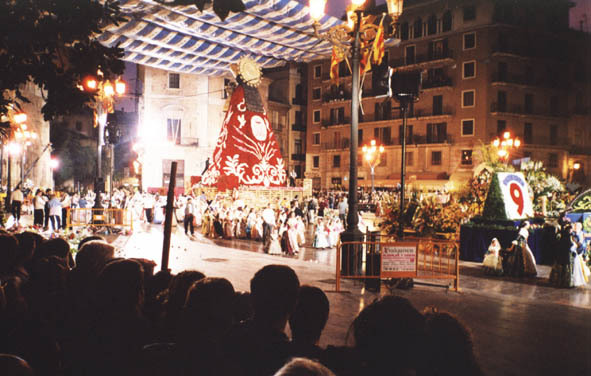 Apart from the carton and paper figures the Fallas are also a religious celebration. 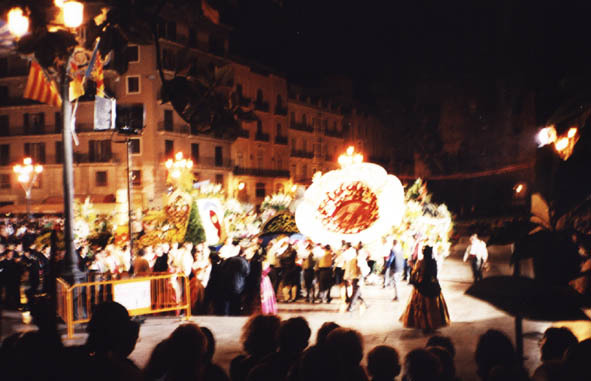 In a huge procession the members of the Falla "association" of each barrio bring bunches of flowers to the Plaza de la Virgen, the square at the cathedral of Valencia. Every girl or woman carries a bunch of flowers. When they arrive at the cathedral it will be put onto a trestle that later will be the cape of Virgin Mary and of the Jesus child. The procession is/are actually two processions from two different starting points. They last not only one day, but two! 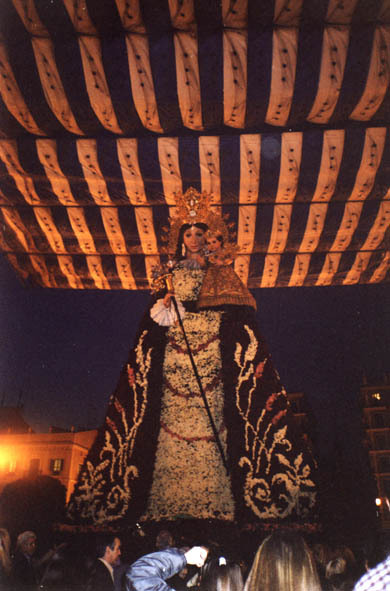 But in the end the whole Plaza de la Virgen is a sea of flowers and very beautiful to look at. Also the costumes of the girls, boys, men and women are really beautiful. And everybody of the family takes part, from the baby to the granny. Even the youngest members of the family take part at the procession. The procession is sometimes also a bit tiring. 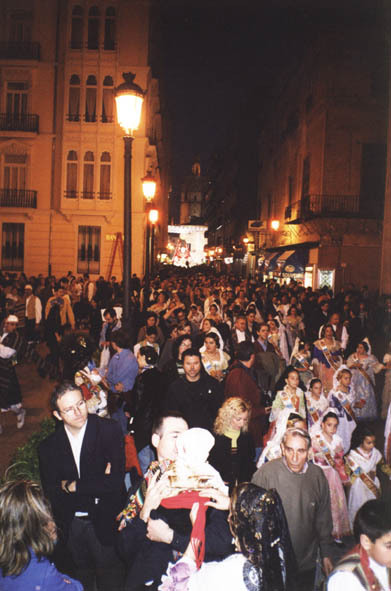 But from the Plaza de la Reina it's only a few minutes to the Virgin María. Finally there, the flowers are put onto the a trestle that later will be the cape of Virgin Mary. The cape is ready nearly. Flowers are put down at the Fountain of Neptune (the fountain is behind the flowers). Now the cape is totally covered by flowers. 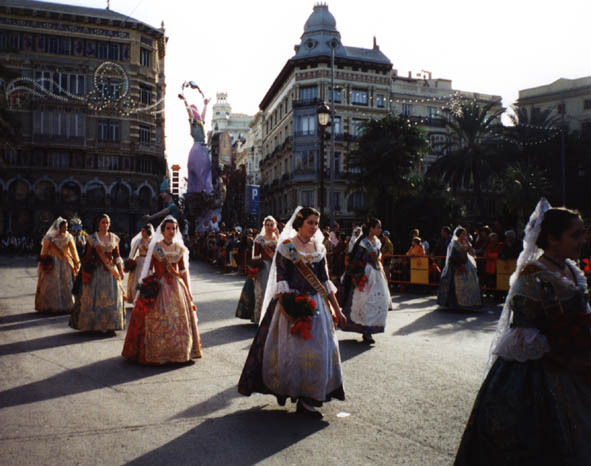 All the members of the Falla associations are heading now home (or to fiestas). 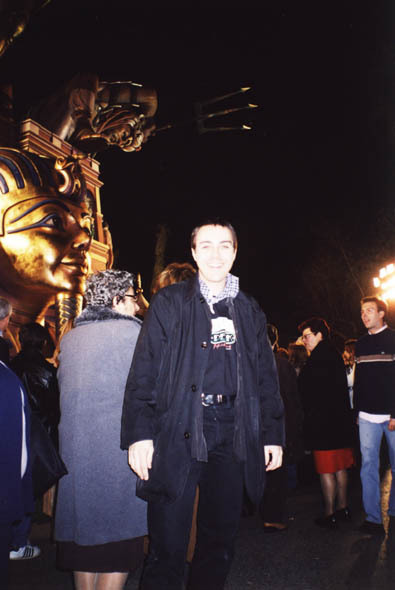 In the background at the end of the street again the statue of María. And that's how Mary looks from her front. It sounds like World War Two, but it's really beautiful to look at. The people here say that in Spain are the best fireworkers of the whole world. Spanish people created the fireworks for the millennium New Year's Eve celebrations in London or for the Olympic games in Sydney, they say. During the Fallas every evening at midnight there is a huge fireworks at the (dry) river in the middle of Valencia. At 14:00 h at the Plaza de Ayuntamiento there is also fireworks each day, but without the illumination, so just noise. It's called a "Mascletta". And the earth really is quaking there. Elderly people who have phobias of World War Two or people who were in Vietnam once I'd recommend not to attend these "Masclettas". But apart from that also nearly everybody has firecrackers and throws them in front of the feet of other people. Viva la infantilidad! To escape a bit from the noise, a little walk to the beach. On the next page all the fiestas and everything else that happend during the trip.